Beaded pendant necklace tutorials are very popular among our customers, so today we’d like to share you a new tutorial on making a cute beaded crown pendant necklace, enjoy! Do you like DIY bead chain necklace? 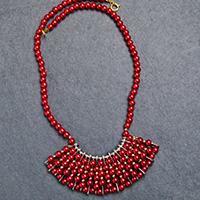 Today I’m going to show you a simple tutorial on how to make red pearl bead necklace in a short time. Hope you can like it. Do you love pendant necklaces? Here I will show you a detailed tutorial on how to make a pumpkin pendant necklace with green crackle glass beads. Do you like DIY pendant necklaces? 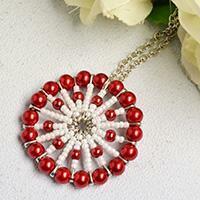 This article will show you a red pearl bead and white seed bead circular pendant necklace. Hope you like it. 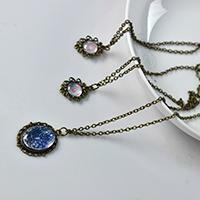 This tutorial will show you how to make vintage necklaces decorated with glass beads and pendants. 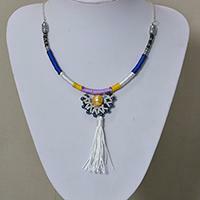 If you are interested in Tibetan style necklace , never miss this one. 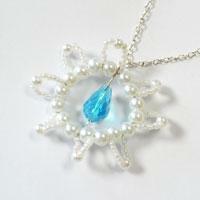 In this Pandahall tutorial, you are going to learn how to make a white and blue seed bead stitch pendant necklace. 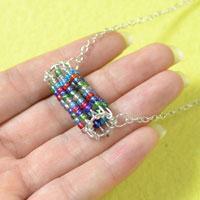 Hope you like the seed bead stitch pendant necklace. 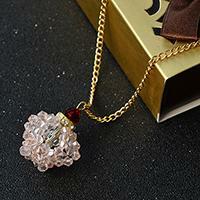 Do you like flower pendant necklace? 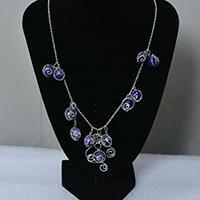 Here I will tell you how to make pendant necklace with beads. 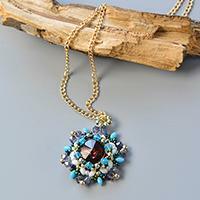 If you are interested in making beaded pendant necklace, then this one will be a good choice for you. In this Pandahall original DIY project, I'll show you how to make a golden wire wrapped pendant and chain necklace. Hope you like this golden pendant necklace. Crystal ball is always clear and cute, do you like it? 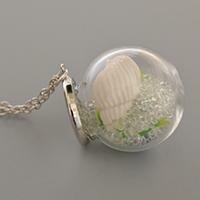 Here I will show you a crystal ball pendant necklace, hope you like it. In this Pandahall article, you can see a handmade cord wrapped necklace with beads and tassel pendant for men. Just check the tutorial below if you like this cord wrapped necklace. 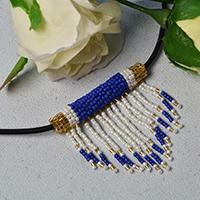 In this article, you can see a handmade blue bead pendant necklace with black leather cords. Hope you like this handmade pendant necklace. 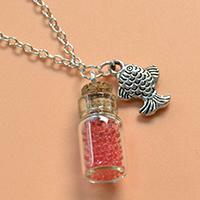 In this easy DIY project, you can see a unique jar glass bottle and fish pendant necklace. It's extremely easy to make. Green hands can have a try! Wanna learn to make pendant necklace? If yes, you can never miss today’s Pandahall video tutorial on how to make delicate white pearl beads pendant necklace with faux suede cord! Do you love fish? 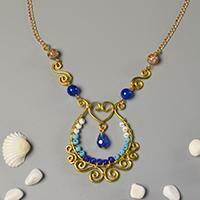 In this Pandahall article, you can see a handmade blue fish pendant necklace. 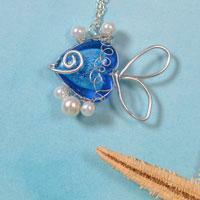 Check the detailed tutorial on making this blue fish pendant necklace. Are you lack of a agate beads chain necklace? If yes, today’s Pandahall tutorial on how to make simple agate beads chain necklace for women is a great choice for you! In this Pandahall article, you can see a unique handmade pendant necklace. The following tutorial shows the detailed steps to make it. 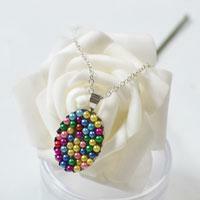 There are many pendant necklaces on our website. 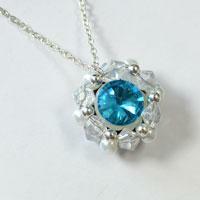 In this Pandahall article, I'll show you how to make a pearl flower pendant necklace. 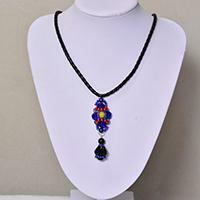 In this Pandahall article, you'll see easy multi-colored seed beaded pendant necklace instructions. Hope you like this easy DIY necklace project. 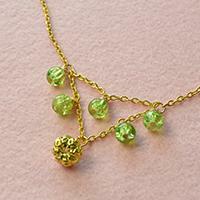 This article will share a handmade pendant necklace tutorial with you. The difficulty level of this DIY project is easy. Green hands can have a try! 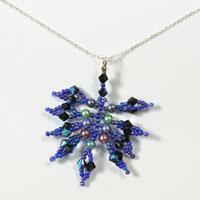 In this Pandahall tutorial, I'll show you how to make a navy blue leaf pendant necklace with beads and chains.